There are many beautiful un-groomed and a few groomed trails for snowshoeing/winter hiking. Trails groomed for snowmobiling are also perfect for snowshoeing. The Wolf Creek Trailblazers groom many miles of trails. Check their website for specifics. Need snowshoes and poles? 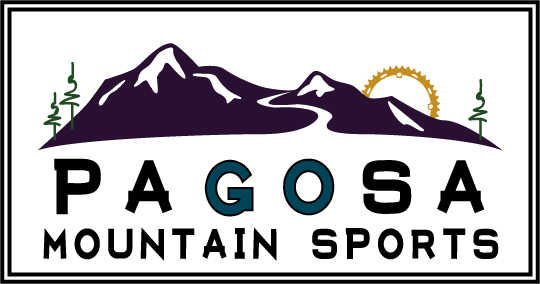 Pagosa Mountain Sports offers snowshoe rentals. 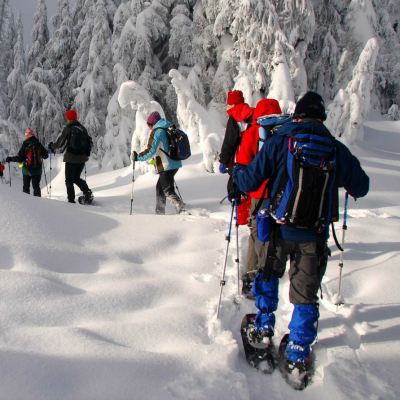 Pagosa Mountain Sports can provide maps and guidance on snowshoeing for your group. April 2019 - The snow is still good at this location. Please snowshoe on the very edge of trails groomed for xc skiing or in un-groomed areas only at this location. Located at Wolf Creek Ski Resort and accessed from the east parking lot. No pass is needed for XC skiing at Wolf Creek Ski Area. Mix of groomed and un-groomed trails. Please snowshoe on trails marked for snowshoe or on un-groomed areas only at this location. 5.4 miles north on Piedra Road from the intersection of Piedra Road and 160 highway. Trailhead on the right after the road turns to gravel from paved. Mix of groomed and un-groomed trails. Please snowshoe only on the un-groomed areas only at this location. 1.3 miles north on Piedra Road from Highway 160. Turn right (east - entrance to Steven's Field airport) on Cloman Blvd for 1.4 miles. Stay left at fork in the road which dead ends at Cloman Park parking lot. East Fork road has been groomed by the Wolf Creek Trailblazers. Check their website for specifics. Mix of groomed and un-groomed trails. The groomed out and back is ~16km of road groomed for snowmobiles but offers a beautiful river side hike in a ponderosa pine forest. Un-groomed trails. Due to its relative popularity, the beginning part of this trail gets packed down and can be easier to snowshoe than other locations. 15 miles north on Piedra Road from Highway 160 for the Piedra River Trail trail head. Parking on the west side of the road. Un-groomed trails. Due to its downtown location, the trails get packed down and can be easier to snowshoe than other locations. In downtown just off of Highway 160, east of the San Juan River. Parking off corner of San Juan and Park Streets and behind the Junction Restaurant off Highway 160. 3.6 miles north on North Pagosa Boulevard from Highway 160 for the Gate 5 trail head and un-groomed trails. Parking on the west side of the road. Un-groomed trails only. Groomed trails at this location are for XC Skiing only. Please DO NOT snowshoe on trails groomed for cross country skiing. Located 17 miles east of Pagosa Springs off Highway 160. Turn north on West Fork Road/Forest Service Road 648. This location receives snow earliest and retains it longer than in town sites. Un-groomed trails and trails groomed for snowmobiling which are good for snowshoeing. 23 miles northeast on Highway 160 to the pass. Parking is on the north and south side of the highway. There is a wide variety of terrain to explore.